Ever have those days where you’re just sitting at work and you are struck with a sudden craving for a particular food and you can’t let go of that hankering until you have it? 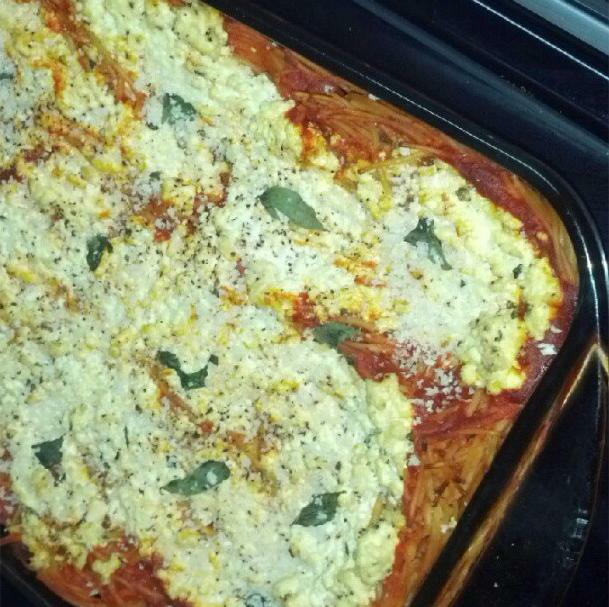 I was dreaming about baked spaghetti with cheese on it today, so that’s what I went home and made for dinner! This vegan ricotta cheese is so fast to make and it tastes good. I had to stop myself from eating all of it by itself before even putting any on the spaghetti. Simple ingredients, simple comfort food – just what I needed today! I am sure we all know how to make spaghetti, but I wanted to write this to say that it’s best to mix the sauce , oil and noodles together before adding them to the casserole dish. The oil will help keep it a little more moist. Crumble tofu into a small bowl and smash with a fork to get all the big clumps out. Add rest of ingredients and continue to mash and mix with the fork until it’s smooth but still maintains that gritty/chunky/lumpy ricotta look to it. Now, put two and two together! 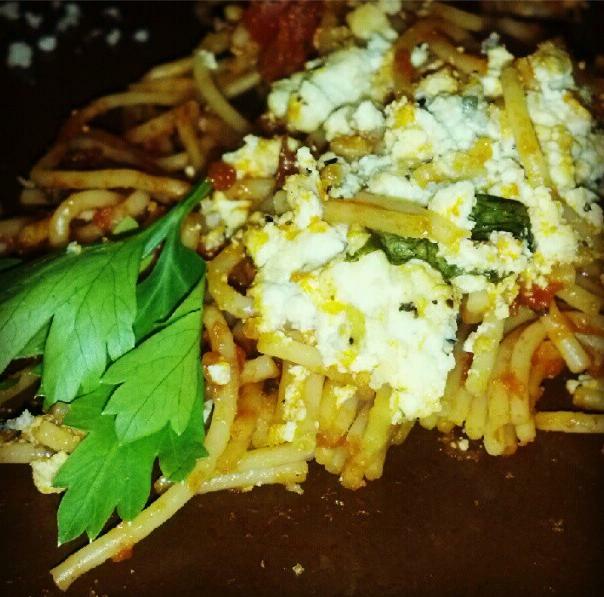 Add spaghetti into a glass Pyrex-type baking dish that has been lightly sprayed with nonstick spray. Add more sauce if you wish, then spread the ricotta over the spaghetti and garnish with fresh basil leaves before baking. Bake for 30 minutes or until ricotta lightly browns on the top. Serve with slivered almonds and/or a sprinkling of panko bread crumbs for crunch! Vegan Chocolate Pudding – Great for Kids! The Veganaise is actually not gross at all. If you like mayo, you’ll like it. Its really not that different tasting. I use it to base a lot of sauces. I really want to try your tofu ricotta! is there another way to make it without the veganase? i can’t eat mayo but i’ve been so hesitant to buy the veganase just because i think it might be gross! haha!